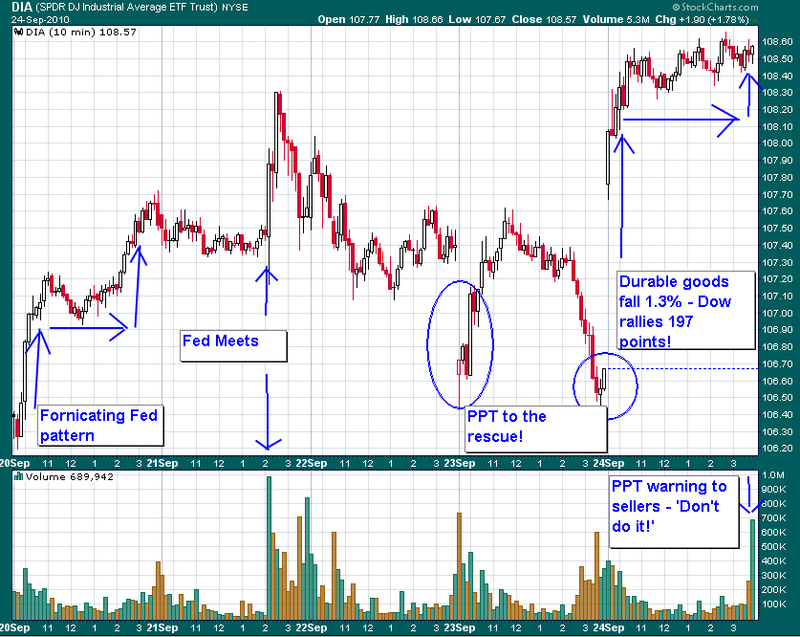 The highlight of the past week was Tuesday as the Fed met to discuss interest rates. I'm laughing out loud now as interest rates will be zero forever and ever. I'm on record many times on this. The idiots at the Fed never read articles like this so they actually think there is a functioning economy after rates hit the floor. There is not. 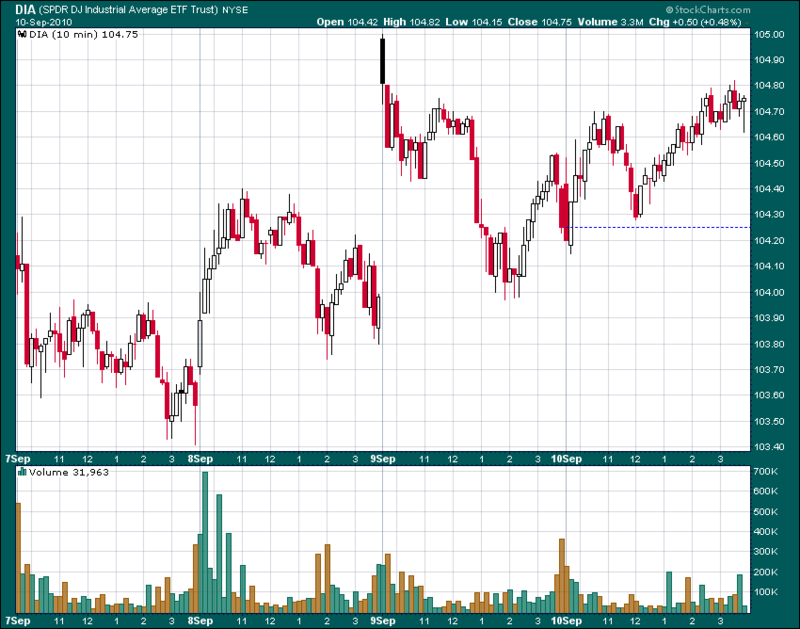 Rather, the Fed meets to contemplate the behavior of the Dow Jones Industrial Average and all other like indices. The Fed's only function now is to fornicate the indices higher in hopes of fooling the dopes in the media and mainstream into thinking all is well. They are also talking 'deflation'. So let's break it down. ON WHAT F#@%*!% PLANET ARE THOSE F%&$%&* IDIOTS LOOKING AT????? Maybe the biggest lie ever told was Cain lying to God about the whereabouts of his brother, Able. To offer deflation as an excuse for quantitative easing is right there with Cain. Bernanke is beginning to make Cain look like Billy Graham! What a bald-faced, ignorant, moronish lie!!! Monday was like every other 'fornicating Fed' pattern day. The Dow opens with 20 minutes of selling and wiggling and then it is hit with a powerful, heavy volume buy episode that lasts about thirty minutes. 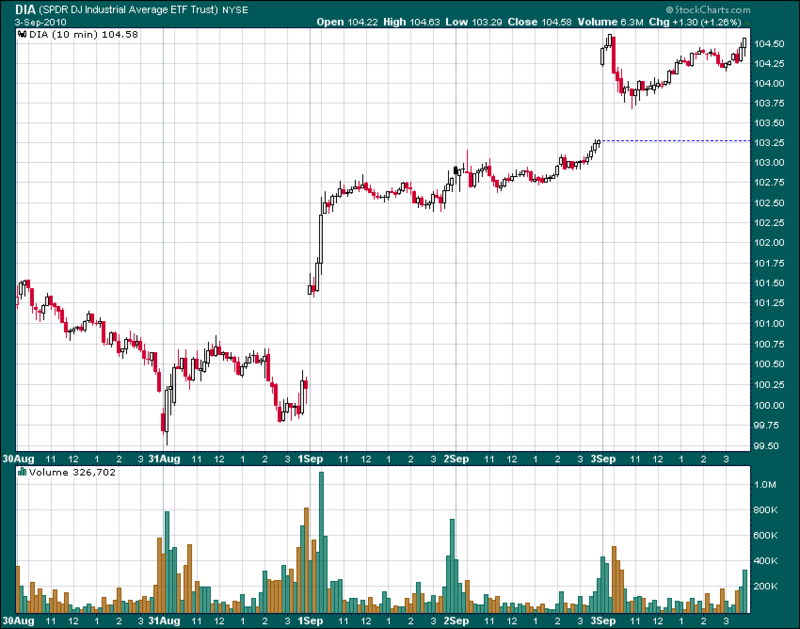 The indices of the world go sideways for a few hours and then more buying hits around 2:30 or 3:00 in the afternoon. Again, the Fed, or PPT if you will, wants the indices going up like Jack's beanstalk so they can see what is up there in the clouds. The main strategy is to fatally injure the sellers of the world. No selling leads to higher index averages. Higher index averages make the idiots of the world think economic bliss. Tuesday, of course, was a bit different as the indices, or as I like to view them, casinos, waited for the Fed's 2:15 announcement. Of course, the PPT is not going to allow for a selloff from a Fed announcement so they had a lot of money ready to plow the indices higher. Twenty minutes of buying and the Dow was up 75 points. 20% of the entire day's trading volume of the DIA struck in the 10 minutes immediately following the Fed announcement. Then traders lost their enthusiasm and the indices faded to even on the day. It could have been worse or even, egad - negative, if not for another almost 20% of the entire day's trading volume buy frenzy in the final 10 minutes. I'll get to the announcement in a minute. Wednesday saw very mild selling continue. Thursday was a nice fornicating Fed day. The casino started lower and a strong buy program brought it back. It went sideways in the middle of the day and rolled over only to be goosed in the final moments with heavy volume. But then Friday came. We got the good news that durable goods orders were down 1.3%. Yeah! The Dow went up 197 points on the good news. 'What good news', you say? Well, if you take away transport orders, durable goods were up 2%. Let's look at the real numbers. Durable goods orders were worth $191 billion dollars. Transportation equipment orders were worth $46 billion dollars. So, if we exclude 24% of the orders because that 24% went down, we can say that orders were actually up! Yeah! Did I mention the Dow was up 197 points on the good news? Oh yeah, there were a over 450,000 new applicants for unemployment and home sales and home starts were still hovering at all time lows and blah, blah, blah. If you take away the 450,000 new unemployment benefit seekers, the economy would really be adding jobs! The PPT don't need no stinkin' economy. They have money and a printing press and they have seized control of the NYSE. Rally boys, rally!!! Let's go back to the biggest lie ever told. The Fed left the Fed Funds rate at zero but said that deflation was likely to be our problem in the future. Yeah, I know. You need a few moments to collect yourself after reading that. I thought Cain told God a whopper when he was asked about his brother, Abel. But boy, I think this one even tops lying in God's face. Deflation. Really. Bernanke said so. My garbage service is up, my satellite TV is up, I don't have health insurance because it has gone up too much, stamps are going up, gas is up, groceries go up every time I go to the store, restaurants all went up, and this fornicating idiot wants us to believe there is deflation about? A friend of mine operates a portable oil change company and he just told me his costs were up 40%. An exterminator guy just came to my house and he wants $895 bucks to spray for termites that we don't have. My rent is up, my phone is up, it costs $2 dollars for one bell pepper and the Fed is worried about deflation???? Let's look at reality. Gold and silver are rallying like the Fed just announced another $10 trillion bailout. Treasury notes have been trying to sell off. The dollar looks poised to complete a bearish head and shoulders and fall to who knows where. Why? Because all this stuff happens when inflation is turning to hyper inflation. Deflation is fed to the dopes on the teevee and the media so the Fed can continue their quantitative easing. What's that? They are buying Treasury notes. If there was deflation at hand, Treasuries would be appreciating on their own and driving yields lower. If there was deflation at hand, precious metals wouldn't be marching higher every day! If there was deflation at hand, I wouldn't get so depressed going to the grocery store every week. To be an outright idiot is one thing. But to be a conniving bald-faced liar is another altogether. And this is the man running our country. God help us all. Friends, the time has come to demand change. No, I'm not talking about that ridiculous Bush clone that sleeps in the White House. The American people need to demand either Bernanke yield to a drug test or he should step down immediately. Better, disband the Fed so we can truly find a real economy. Here is the chart of the DIA for the past week. Note the fornicating fed pattern as knowledge of anything is no longer important. Like standing in front of a slot machine, it is the timing that is important now. We just want to be present in those precious 10-minute burst buying bars that the PPT orchestrates. The Fed leaders met at the end of August in Jackson Hole, Wyoming. Business leaders and investment gurus attended the meeting. Apparently, it was decided that the stock casino needed a little boost so at the very beginning of September, up we went. I have included below the weekly intraday charts for the past 3 weeks. I believe we have a new chart pattern here that I call the 'Fornicating Fed'. It is characterized by a burst in buying at the beginning of the day and a burst in buying at the end of the day accompanied by fairly strong volume. The strategy is simple - frustrate and damage the sellers. If the sellers and short sellers go away, the indices have a natural tendency to rise. Retirement contributions and pension plans constantly fuel the indices along with bullish investors. Sellers are the kill-joy. Give them a knuckle sandwich every time they sell and they will go away. At least, that seems to be the strategy coming out of the Jackson Hole meeting. Sellers certainly have their reasons to sell. The economy is slogging along at best and the economic news that has been used as rally fodder is all 'not as bad as we thought'. For instance, this week was very typical. The Irish banking system didn't collapse yet. Greece didn't default yet. China's growth is only slightly slowing. The US suffered 450k new unemployment claims and that's down from 453k. Congress extended long-term unemployment benefits. Congress passed some new bogus tax credit program for small businesses. Only 1 in 7 Americans lives in poverty. It could have been 1 in 6. Only 40 million Americans receive food stamps. It could have been 60 million. Only 20% of Americans live with no health insurance. It could be 30%. Health insurance premiums are only going up 15% or so for most Americans. It could have been 25%. Home foreclosures hit a record. They could have hit a higher record. To subsidize the pitiful housing market that we have, Fannie and Freddie are costing tax payers half a trillion. They could be costing a trillion. And, we have now only closed 125 banks this year. See! The 'recovery' is taking shape! It is easy to see why sellers are nervous. So to combat any selling and to foment the illusion of a Dow rally, the Fed is acting to intervene and manipulate the indices higher in the morning and at the end of the day. The Fed is also heavy into their 'quantitative easy' policy of buying Treasury bills and notes on the open market. This simply means they are artificially keeping interest rates lower than they would normally be. 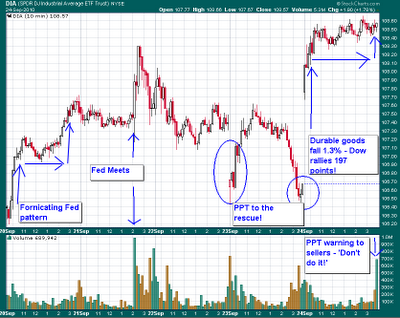 Why would we suspect the Fed is involved in index manipulation? One, the Fed IS the market. Two, they buying is perfectly coordinated and timed to terminate sell attacks and transform them into rallies. Three, whomever is manipulating the markets is doing so with a lot of money. Four, the rally is supported with 'less bad' economic news. 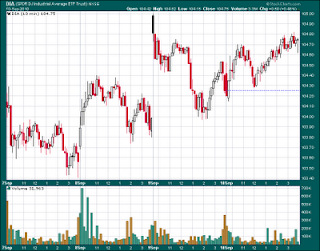 What do we learn from the charts below? Obviously, we know we should buy every dip. The difficulty is every dip is only about 20 minutes in duration. The Fornicating Fed pattern seeks to blow up selling before it can really do any harm. We also know we should watch the close of the previous day. If the Dow closed with a strong rally, wait 5 minutes or so after the market opens the next day, watch for the dip, and start buying 18 minutes into the dip. If the Dow closed the previous day with a 20 minute sell off, buy at the open the next day. Don't get me wrong. The economy and the stock casino is an outright joke and con. It is completely manipulate and contrived. However, we just need to understand the new rules and learn how to take advantage of them. Besides, aren't you glad we don't have to pay attention to corporate earnings or economic data anymore? Let's take a look at Chart 3. The indices finished with a little rally at the end. What we want to do Monday is wait 5 minutes, let 18 minutes of selling run its course, and then start buying 2 minutes ahead of the inevitable Fed buy program that should kick in, oh..., at about 9:55AM. Make the Fornicating Fed work for us! 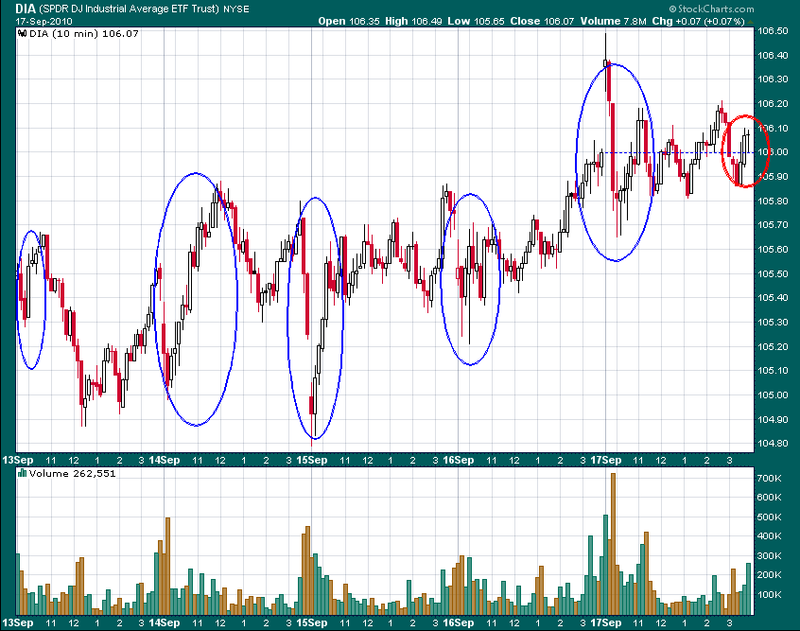 For extra help, I circled the 'magic moments' in Chart 3 to help pinpoint the timing of the trend turns. For instance, our central banks have now decided (in earnest since 2003) that the equity markets are their domain and as such, now dominate equity trading in an effort to stimulate economies towards growth. Clearly since the March lows of 2009, the Fed and the PPT have assumed complete control of the equity market. Almost as if the line in the movie 'Rocky' muttered from Apollo Creed to Rocky at the end of the climactic fight, "Ain't gonna be no re-match" has come to life, the Fed has thrown down the gauntlet to say, 'Ain't gonna go back to Dow 6,500'. Indeed we won't. All we need is money and a trading account as provided by the Working Group on Financial Markets. Of late, the PPT has made it quite clear that Dow 10,000 will be defended with every ounce of ink they can muster. Reality no longer matters. Neither do fundamentals. If the Dow drops below 10k, lookout! Here comes a buy program that is fast, concentrated, and directed right at anyone contemplating a sale of any equity. So for this week (ending September 10, 2010), we have confirmation that the PPT rally ignited by the worst August in 10 years is going to hold. Now, how do we know? 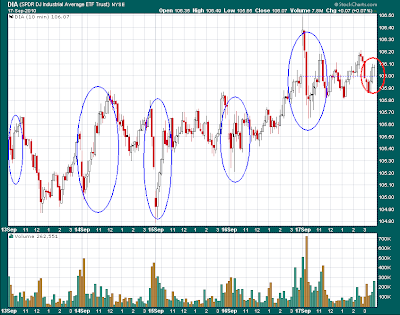 First, we must identify the rally pattern. I won't rehash all the economic news but suffice to say that almost all of it is bad. The media and Wall Street spin is that none of the bad news was as bad as 'expected' or as bad as it 'could have been'. Yes, even the Fed minutes told us the economy was slowing even more and unemployment would remain high forever. Nevermind. The Dow is now the modern barometer of economic strength. Regardless of slow economics, high unemployment, bankruptcies on every street, real estate depression, and debt that can never be repaid, we have a stock index rally. Like I said, 'all you need is a lot of money and a trading account'. So, the first sign of the new chart pattern is a horrible economic backdrop yet coordinated with a strong index rally. The second sign of this new pattern can best be explained by looking at the charts. Chart 1 is a 10-minute intraday, 5-day chart of the DIA for the period August 30, 2010 through September 3, 2010. The PPT has obviously opted to shift from their prior strategy of waiting until 3:30PM to engineer one of those miraculous 200-point, surging to the close rallies to a strategy of bullying the sellers and short sellers at the open of trading. The change in strategy is most likely due to the fact that after years of manipulation of market indices at the end of the day, the impulse to sell has not terminated. After all, if all the sellers went away, the indices would have a natural tendency to rise thus fooling the sheople into believing all was economically well. The trick is to eliminate the sellers and short sellers. The PPT buy programs at the end of the day were impressive but the sellers would invariably be waiting to resume selling at the opening the next morning. Given all their Herculean efforts over the past few years, it would seem obvious that the late day rallies have done nothing to curb selling. So we now have a change in strategy. The new strategy is to blast the indices higher right from the opening moments of trading. This does several things. First, no matter what horrible economic news has been announced, market indices blasting higher at the open of trading corroborates the idea that the 'news' could have been worse. Sense it's not even worse, ergo, it is therefore 'better'. See, we are already into the manipulation of psyche. Second, the burst at the opening brings cheer to traders for the day. The momentum is rising. Traders like that. Third, the threat of a late day rally is still there. Should sellers and short sellers choose to attack after the PPT jacks the indices higher in the morning, they must worry that the PPT will be back in the afternoon to finish them off. Let's look at Chart 1. From Chart 1, we must understand the 'womb of the rally'. The last six trading days of August each flirted with Dow 10,000 and below. Remember, this was the worst month of August since 2001. The Fed knows that investors will soon be getting their monthly statements in the mail and will likely be spooked by what they see. What they see on the statements will no doubt confirm what they see all around them with bankruptcies, foreclosures, and empty retail space. In addition, the month of September is statistically the worst month of the year for the stock indexes. Worry not my friends! To keep the Fed scam going, the PPT no doubt went into high gear immediately blasting the Dow higher from the first day of the worst month of the year. And of course, the new zero is Dow 10,000. The PPT will fight this level with everything they have. So up we went. But look at the chart. Each day was defined by about 20 minutes of straight up buying followed by muddling directionless trading. If needed, the PPT pumped in a booster shot at the end of the day. This action struck fear in sellers and they went away. So we now have a new trading pattern to consider. I think we should call this one the 'Fornicating Fed' pattern. It is pure manipulation (that used to be illegal) coordinated with shill banks (insider information still is illegal) and ignored by the media (not really 'media' as much as market cheerleaders). This pattern is identified with its ferocious 10-minute 'flash burst' buying gapping the trade generally at the beginning of the day. Generally this strong up trade should be accompanied by horrendous economic news like 'existing home sales were the worst in 40 years'. The 'flash crash' got a lot of attention but in the end, the Dow was only down 360 or so points on the day. The first 3 days of September saw the Dow rise 454 points and horrible economic news and no one said a word! So let's look at this week's trading and see if we see the pattern continue. Look at Chart 2. Well, Monday was Labor Day so on Tuesday, we saw the Dow lose over 100 points. After all that hard work on the part of the PPT! The nerve of sellers who hit the index with a high volume sell attack! Well, you know what that means? 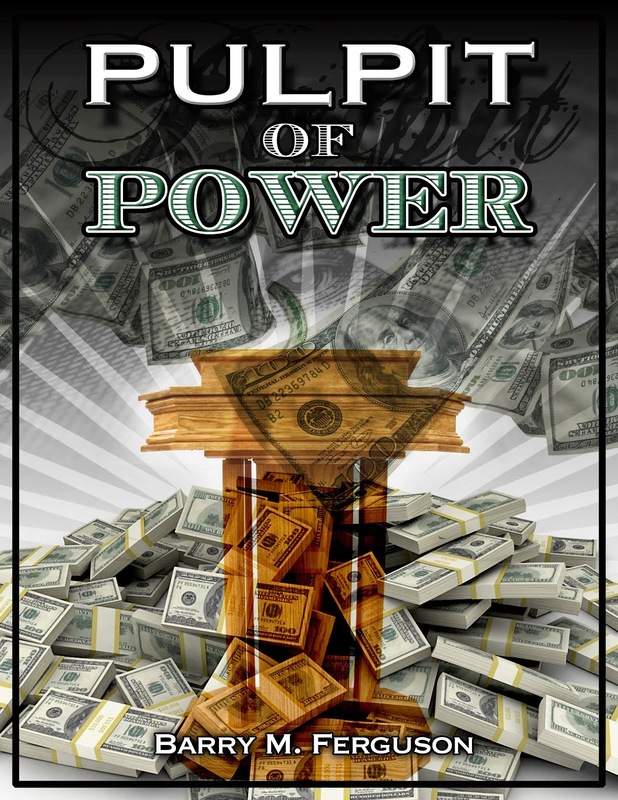 This is war and the PPT has more money than all of us. Pow! Straight up we went on Wednesday right out of the block. The 'Fornicating Fed' is still with us. Thursday? Pow! Straight up at the opening. And now Friday? Let me just tell you that Thursday saw the Dow lose some 30 points of its rally in the final 30 minutes of trading. Now, what do think would happen on Friday morning? The 'Fornicating Fed'! Indeed. There it was. Another rally right at the open of trading. Would it hold? Beyond my perverse sense of humor, why now does the Fed/ PPT defend the Dow 10,000 level and create the new chart pattern, the 'Fornicating Fed'? Very simply, the Fed/ PPT are now themselves very astute chart followers. Dow 10,000 is very clearly the neckline in a long and sloppy head and shoulders pattern that would imply downside risk to at least Dow 9,000 or a bit lower should it be broken. Given the horrendous nature of the economy, er, ah, I mean, 'recovery', falling stock indexes would likely add fuel to the fire that we are all in deep debt crap with no way out. Now all we have to do is pray everyday that 'please Mr. Bernanke, don't abandon us now'. Put some money into the Dow at the end of the day and watch the magical manipulator of markets matriculate money to the moon! Oh, just one minor warning. The volume of trading on the DIA has been waning since the late August blast from the PPT. In fact, today's (Friday) trading volume was about one-third of the average trading volume. Friday's total volume was only threes times the volume of Wednesday morning's 10 minutes of opening rally volume! Generally, that's not a good thing. Oh well - hopefully the PPT will be up bright and early on Monday morning! Well, just one more thing. I don't know that it means anything but the Dow Real Estate sector (IYR) is way out-performing the Dow and the semiconductor index (SOX) is way under-performing the Dow year-to-date. What we can surmise is the sectors that lose money do well and the sectors that make money do poorly. That's healthy. But in the end, we all know who owns the real estate. It's the banks! Hooray! Everything for the big banks! Sis - boom - baa!